There are a variety of United States passport books that are issued to travelers for specific reasons. Our guide to US passport books will teach you about the different types of passport books so you will understand which one you need and why. Read on for more passport book information. Also called “tourist passports,” “regular passports,” and “ordinary passports,” the passport book with the blue cover is the one issued to the vast majority of US citizens. It is appropriate for all travel purposes except for travel for US government purposes, including tourist travel, business travel, flight crew travel, and travel for education or employment. 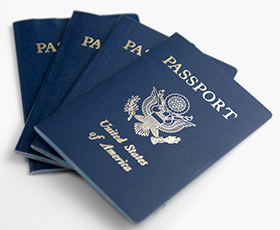 Personal passports are issued at all US Passport Agencies. Official passports are issued to US government employees and contractors who are traveling on US government business. They are also issued to active-duty members of the military who will travel overseas on military duty. Official passports are issued only in Washington, DC, at the Special Issuance Agency of the Washington Passport Agency. US citizens may hold both a valid official passport and a valid personal passport at the same time. Official passports are only to be used when traveling on government business, so any leisure travel must be done with a personal passport. Diplomatic passports are issued to employees of the US State Department who are required to travel or work overseas on State Department business. Diplomatic passports are issued only in Washington, DC, at the Special Issuance Agency of the Washington Passport Agency. These documents, issued by US Citizenship and Immigration Services, look like passport books, and function like passports as identification and travel documents. However, they are not citizenship documents – they are issued only to non-US citizens legally residing in the United States. These travel documents are most often issued to people who are unable to get a new passport from their country of citizenship. Non-citizen travel documents can be used like passports for entry into other countries and to acquire visas. They also establish that the bearer has the right to re-enter the United States.